A new collaborative research project is aiming to design the next generation of motors for electric vehicles (EVs). Project lead Cobham Technical Services, working alongside Jaguar Land Rover (JLR) and Ricardo, hopes to eliminate the use of expensive magnetic materials in high-efficiency, lightweight traction motors. ‘Although electric machines have been around for a very long time, we are very much at the early stages of development of electrified powertrain systems and there is clearly a long way to go in terms of the optimisation of different architectures,’ Anthony Smith of Ricardo told The Engineer. The team will focus on the development of a powertrain based on switched reluctance motors. 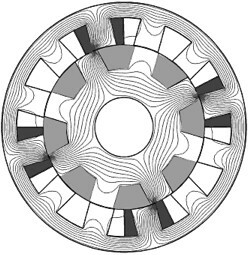 The key advantage of this type of motor is that neither the rotor nor the stator (stationary part) requires the use of permanent magnetic components — that is, materials that create their own persistent magnetic field (generally rare-earth metals). Instead, the electromagnetic poles are manufactured from laminates arranged in pairs across the diameter of the motor. As each pair of stator poles is energised, the closest diametric element of the rotor will be attracted as part of a magnetic circuit and a torque is developed in the rotor shaft. The number of rotor poles is typically less than the number of stator poles, which prevents the poles from all aligning simultaneously — a position that cannot generate torque. Reluctance motors can deliver very high power density at low cost but are complex to design and control. As part of its work on the project, Cobham will develop novel multi-physics software. Using these new tools, JLR and Ricardo will design and manufacture a prototype switched reluctance motor that addresses the requirements of luxury hybrid vehicles. Smith explained some of the technical challenges involved in this process. The total value of this particular motor project is £1.5m, with half the amount funded by the Technology Strategy Board (TSB) and the Department for Business, Innovation and Skills (BIS) and the rest by the project partners. The project itself is one of 16 collaborative research and development programmes to have won funding from the UK government-backed TSB and BIS, which have agreed to invest £10m aimed at achieving significant cuts in CO2 emissions for vehicle-centric technologies. I wonder if this design team has contacted AC Propulsion in San Dimas, CA, about how they came up with a rotor/stator combo using zero rare earth materials over ten years ago. Their drivetrain achieves over 90% efficiency, and they’ve been making them a long time. Their T-Zero BEV is famous for having a 300 mile range with a 0-60 time of 3.6 seconds, and that was with old technology Li-Ion batteries. If I were these people, I would license ACP’s technology in order to get a boost to completion. Great to see an article on EV, using SR Motor. My doctoral research was also on this motor for EV, and we have a prototype. All the Best. It’s true that induction motors have been around for many years and can potentially make good EV traction motors. Our project, however, is aimed at getting even more power and efficiency than could be delivered by the best induction motor – but without resorting to the use of permanent magnets.